Both XWP's THE BITTER SUITE (58/312) and BABYLON 5's The Very Long Night Of Londo Mollari are about the repentance of characters who have explored the depth of evil, and are making difficult comebacks. According to the Catholic Catechism: "Penance requires...the sinner to endure all things willingly, be contrite of heart, confess with the lips, and practice complete humility and fruitful satisfaction". Both of these shows are about the challenges their respective heroes face on the path to redemption, and, particularly, they explore the difficulties the heroes have with contrition and confession. Xena, about to hurl Gabrielle off the cliff. 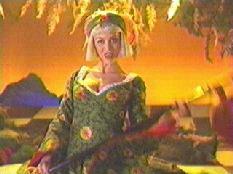 Although at a superficial level, THE BITTER SUITE (58/312) is about Xena and Gabrielle laying aside their hatred and picking up their love, the truth is that this episode is primarily about Xena's penitence. Gabrielle has already repented by killing Hope, her first clean kill. The characters have landed in a lethal situation (over the cliff, under the water) and must repent or die. Londo and G'Kar had a love/hate relationship throughout B5. Londo Mollari of B5 is in a similar situation: he has committed great crimes against another race, the Narns, and against an individual within that race, G'Kar, and is faced with the choice repent or die. Not only do these shows share the same crux (the hero uttering the words "I'm sorry"), but they are conducted in similar frameworks. We will be examining the ways in which these two proud heroes reach this point. For Xena and Gabrielle, as well as for Londo, the dream world is entered by moving into a state of transition between life and death. Xena and Gabrielle enter this state when Xena's attempted vengeance against Gabrielle brings them both to a cliff. When Gabrielle defends herself, they are both thrown into the water, where they must make their decisions about penitence. Londo moves into this state when, after drinking some bravari that station security wanted to quarantine, he collapses of an attack of the left heart. Centauri anatomy, we are told, uses a right heart to move the blood and the left heart to cleanse the blood. Thus, it is symbolically significant that it is his left heart that has failed: he is in need of cleansing. Symbolically Illusia and Londo's dreamworld bear striking resemblances to each other. One of the first images we are shown in Londo's dreamworld is that of Delenn dressed as a fortune teller with a Tarot reading spread before her. (I do not ask why a Centauri dreams in images of earthly commonplaces.) Mollari asks if the reading is of the future. She replies that it is of his past and gathers up the deck. The deck bleeds, symbolizing all of the bloodshed that Mollari has caused. Delenn leaves him with a puzzle. After ascertaining from Mollari that he wants to live, she tells him more is needed: a word. 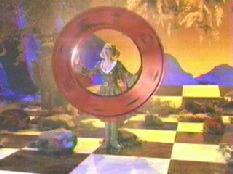 Callisto sets the chakram-like wheel of fortune in motion. A more traditional looking Wheel...of...FORTUNE! Xena's world has itself become a Tarot reading and the Wheel of Fortune she is shown is directly from the Rider-Waite deck, the same deck that influenced the imagery of T.S. Eliot's "The Wasteland". (I do not ask why Ancient Greeks dream of a Tarot card that was designed in 1910). When she awakes in the dream, she sees Callisto dressed as the Fool of the Rider-Waite deck. In this deck, the Fool is rendered as just about to step off a cliff into raging seas below, just as Xena and Gabrielle did. (An entire paper can be devoted to the use of the Rider deck in determining the setting of the world of Illusia, so, having noted it, I will not belabor the point.) A puzzle is proposed to Xena by Callisto as well: "Can you undo what you create"? Who's fooling whom in this episode? So both Londo and Xena enter their dreamworlds with a puzzle to solve. Solving that puzzle is the thing that will determine whether or not the characters live. Death means damnation for both of them as well: Xena will have died with Gabrielle's blood on her hands, a sure ticket to Tartarus, and Londo will join Mr. Morden in hell. The important difference is that Xena can take as much time as she wishes to succeed at this task, for Illusia, we are told, is "...carved out of space/ in the absence of time". It is uncertain what would constitute failure in Illusia as no constraints are defined, although, in Dahak's temple, one gets the feeling that its "now or never". Londo, however, has a very clear time constraint: he must solve his puzzle before his left heart fails completely. In Illusia Who Must Repent? Gabrielle is the worse for wear before being cast into Illusia. Gabrielle has very little to repent for in THE BITTER SUITE (58/312). She repented completely in MATERNAL INSTINCTS (57/311). At Solan's death she felt contrite. She confessed in her apology to Xena, gave fruitful satisfaction by killing Hope -- so the daughter of Dahak cannot kill again, and endures a purification ritual involving flagellation. She enters Illusia with nothing more on her conscience than the not unjustified anger she is feeling towards Xena for attacking the Amazons, dragging her through fires and over rocks, and attempting to throw her over the cliff. Xena's betrayal of Gabrielle in this situation is fairly complete and utterly unmediated. Her actions are those of an unrepentant warlord; they require malice and forethought. 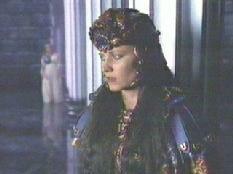 This frees Gabrielle to stand in Illusia as Xena's accuser, and to prod Xena along the path to repentance. Xena hunted Gabrielle down in a sacred space of the Amazons. Her purpose is to exact revenge for Solan's death by torturing and killing Gabrielle. This act, if achieved, is sufficient to completely deconstruct all of the good she's done since her recovery. She knows better. She engineered Goliath's death because his obsession with revenge had rotted him [ GIANT KILLER (27/203)]. It is bad enough that Xena hardened her heart towards a contrite Gabrielle. If they had separated then for life, it would have been sad. However, stalking, hunting, and killing someone who has laid her life on the line for you and endured hardship to save your life is utterly inappropriate behavior. And Xena knows better. The death of Gabrielle as a consequence of these actions is that which Xena has created, and must now undo. When Xena first encounters Gabrielle in Illusia, she kills her. When the Fool questions Xena about this event, Xena becomes contrite, however, her pride stops her from making confession. It should be noted that it is particularly significant that Callisto plays the Fool here. Callisto has realized her dream of revenge against Xena in MATERNAL INSTINCTS (57/311) and found it hollow. By the time we reach Illusia, Callisto has fully explored the path that Xena is now walking, and is, therefore, a most fitting guide. When Gabrielle herself takes Xena to task, Xena becomes tongue-tied. Xena completely ignores Gabrielle's demands, and shifts her focus to her puzzle, effectively turning her back on its solution. Next comes the `blame-fest' where Gabrielle asks the very pointed question, "Xena, why is it never your fault"? Instead of answering, Xena evades again, finding something other than herself to blame for the echoes, and thus solves an immediate problem, but, once again, she turns her back on the inevitable solution. 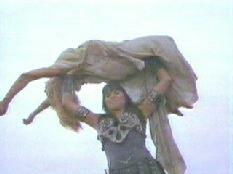 In the course of the song that follows, Xena focuses on the fact that she is not in control and that she is exposed. This is perhaps the first time that Xena has been this vulnerable, and it is all she can think about. Her pride and her anger form obstacles to her repentance, and she continues to blame Gabrielle even as Gabrielle explicates Xena's culpability to her. The blame-fest ends only when Dahak wrenches Gabrielle from Xena. Xena pursues. Xena begins to realise the depth of her guilt in the temple scene. In the temple of Dahak, it comes together. Xena sings, "I never dreamed that we'd be/ Distanced by a hate --/ That all the trust we had would go". Contrition exists and confession is made to all the sins of which Gabrielle is aware. Gabrielle is able to let her hatred go and she passes through the baptismal waterfall to the cavern in which Solan (who himself has evidently forgiven Gabrielle whatever culpability she may have had in his death) awaits. She is puzzled as to why Xena cannot. The next step is Xena's to take alone. Xena, who earlier lamented the loss of trust between herself and Gabrielle, now restores it by confessing to killing Ming T'ien. Not that killing him was in and of itself a bad thing, but lying to Gabrielle was. With this understanding, and the admission that she cannot always shield Gabrielle, tears of contrition come flowing forth as from a geyser. She begs the forgiveness of both Gabrielle and Solan. She is then able to step through and rejoin Gabrielle. Her desire to restore her relationship with Gabrielle gives her the strength to choose life. Londo Mollari, a complex hero and anti-hero in one package..
 Londo Mollari enters his dream world alone. When he finds Delenn and she sets him his puzzle, he also discovers a grate from which a red glow is emanating. Uncovering this grate reveals Mollari's left heart, straining to beat, constrained by a plate of glass. To free his heart, this glass must be broken, but Mollari finds that he is incapable of doing so. In his dream, he wanders to the Zocalo, Babylon 5's bar, and encounters a figure of Sheridan, who died and was resurrected in the previous season. Mollari asks Sheridan what it is like to be dead. Sheridan replies that he didn't like it. Mollari notes that the bar is empty and all the bottles are empty. Like Xena who allows herself to be distracted from the path to her redemption by examining her surroundings, Mollari attempts to deconstruct his dreamworld, flippantly commenting that the "metaphor is getting a bit thick". When Sheridan tells Londo that if he wishes to live, he must turn around, Londo refuses. Shame, the dark side of Pride, prevents him from turning and facing G'Kar, just as it prevented Xena from assuming responsibility for killing the illusory Gabrielle. The first step to redemption is to "endure all things willingly", and to begin, Mollari must first be willing to endure G'Kar's gaze. Vir, a sidekick as intensely loyal as Gabrielle and nearly as abused. Vir, Londo's sidekick, becomes the raison d'etre for Londo's redemption. He has a hook into Londo's heart that neither Delenn nor Sheridan possesses. Vir explicates to Londo the meaning of this dream and pushes him to face G'Kar. Londo is in despair at this point and willing to accept his death as the path of least resistance. Vir is able to draw Londo out of despair by expressing the loss he would feel at Londo's death. This moves Londo to act. He cannot betray Vir by abandoning him, so he turns to face his accuser. Once Londo faces G'Kar, his redemption is inevitable, but it is hard coming. G'Kar outlines to him the things he allowed to happen without comment. Mollari's sin in G'Kar's eye(s) is one of omission. Mollari did nothing to intervene. The next thing that Mollari must endure is the proverbial "mile in the moccasins" -- they return to Cartagia's throne room where Mollari is whipped just as G'Kar was. Even after Mollari screams, contrition still does not come. Mollari asserts that he has never apologized for anything in his life. His pride is still in the way, and only when G'Kar turns to leave, taking with him Londo's last shot at life, does Londo finally call out, "I'm sorry". He finds himself back in the room with the grate, where he breaks the glass and frees his heart. On the path to redemption, Xena has a number of advantages over Londo. Illusia is a playworld in which she has the freedom to explore the consequences of the act she tried to commit in the real world. It is divorced from time, so there is no worry of their bodies drowning before this is all worked out. Londo has no such luxury. His actions in his dreamworld directly impact the condition of his living body. He must solve his puzzle quickly and efficiently. For both Xena and Londo, their will to live is determined by the love of their sidekicks. Londo has Vir's unconditional love and cannot betray it. It is that which gives him the strength to face his accuser. For Xena, the sidekick and accuser are one. Gabrielle's love is now very conditional and Xena must come clean or lose it. The desire to restore the trust between them prompts Xena to contrition. Both Xena and Londo Mollari are capable of acts of great evil with resounding consequences. They share the delusion that they can protect their sidekicks from these consequences. This is pure pride and this is a sin for which both must repent. The one word "sorry" comes easily to neither of them. It is also the key to the redemption and survival of both. Xena and Gabrielle make up for lost time in the post-Illusial surf. I am a business programmer/analyst with an MA in English literature. I discovered XWP as a neat bonus after being trapped by my partner into watching Hercules: The Legendary Journeys . We both took an instant liking to it, and have sort of stopped watching HTLJ. Xena is just so much more interesting for things like, well, character development, plot, a hero who isn't a big dumb Viking from Minnesota, etc. Favorite line: Xena to Tara in FORGIVEN : "You want to compare bad deeds, I'll bury ya." First episode seen: CRADLE OF HOPE (04/104) -- aka "Baby-Toss".